Aimeth (centre) with Ian and Judy at Fair Grounds. Sheffield has gained a dedicated Fair Trade shop in the shape of Fair Grounds at 195 Whitham Road, close to the University and hospital. Fair Grounds sells a wide range of Fairtrade foodstuffs and fairly traded crafts, toys, jewellery and accessories. 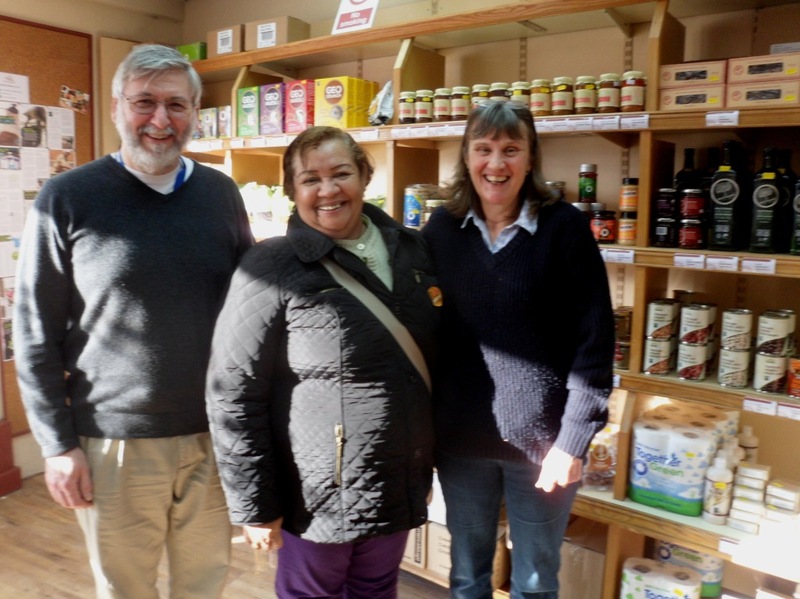 The new shop opened just in time for Fairtrade Fortnight and the visit of Columbian banana farmer, Aimeth Angulo, who enjoyed a long browse and a chat with staff members, Ian and Judy. Tom (left) and Aimeth (third from right) with staff and students at Oasis Academy. Fairtrade Yorkshire covers the Yorkshire and Humber Region and hence we support, not only Yorkshire folk in the promotion of the Fair Trade cause, but also the good people of northern Lincolnshire who live on the south bank of the Humber. Fairtrade hotspot in this area is the town of Immingham which has an active campaign to gain Fairtrade status. During Fairtrade Fortnight, Columbian banana farmer, Aimeth Angulo visited the town to support the campaign. Ken Wyatt shows off Fairtrade beers. Rotherham Real Ale & Music Festival was held at MAGNA on 5th – 8th March, coinciding with Fairtrade Fortnight. 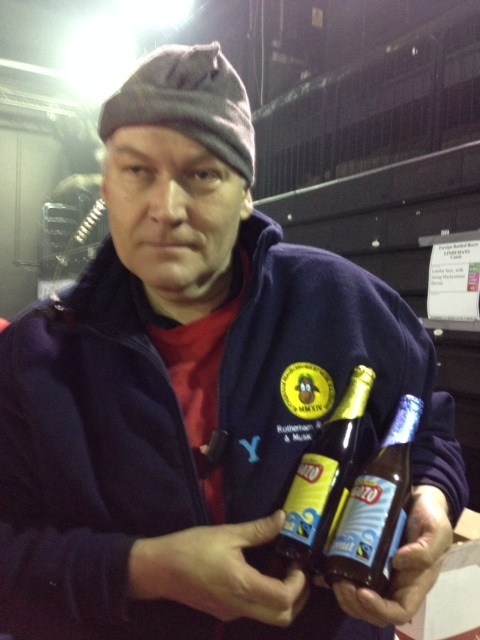 Ken Wyatt of Fairtrade Rotherham, who is also one of the organisers of the festival, made sure that there were Fairtrade beers available for South Yorkshire drinkers to enjoy. The festival is regarded as one of the best in the UK and supports a number of local good causes. All who help run, set-up, take down and administer the festival are volunteers; making it one of the largest volunteer run events in the region. 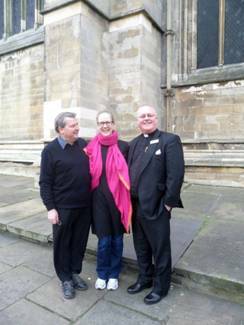 Church Warden, Clive House, Development Officer,Louise O’Brien and Vicar, Rev Paul Shackerley. Senior staff at Doncaster Minster expressed their support for Fairtrade Doncaster. 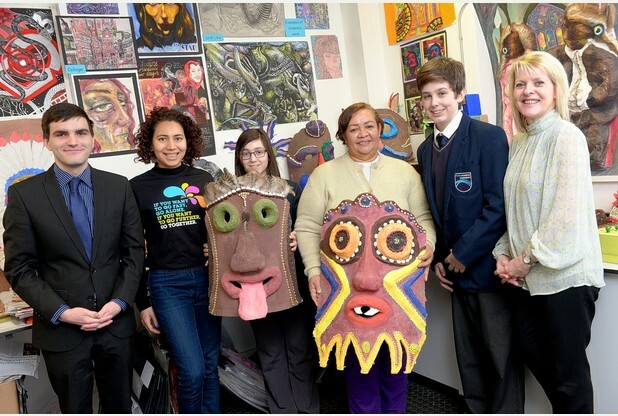 The Metropolitan Borough of Doncaster is very active in its promotion of Fairtrade and towards the end of 2013 a new Fairtrade Borough Steering Group was set up to support work with businesses, schools, Doncaster College, faith and community groups. Coordinator of Fairtrade Yorkshire, Mark Dawson, met with the Vicar of the Minster, Paul Shackerley, and members of his team, to discuss the role of the churches and Fairtrade in Doncaster Borough.